Held in Nottingham, England on October 17th, 1999, this DVD presents the cream of British bodybuilding. The DVD presents the complete men’s section of the Finals, as well as 5 minutes of Pump Room. Includes sensational guest poser from Norway – TOMMI THORVILDSEN. 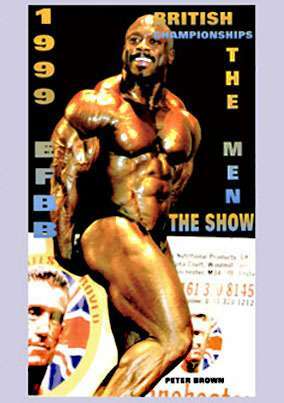 Held in Nottingham, England on October 17th, 1999, this DVD presents the cream of British bodybuilding. The DVD presents the complete men’s section of the evening show, as well as 5 minutes of Pump Room. Includes sensational guest poser from Norway – TOMMI THORVILDSEN. All nine classes include compulsory poses, posedown, posing of the class winner and presentations. Plus the exciting overall judging and presentation to PETER BROWN. 4 Pro cards were also up for grabs making this an outstanding national championship.